Title: And Can It Be, That I Should Gain? The first three stanzas of this hymn explore both the contrast between the glory of heaven that Christ came from and the suffering He endured on earth, and the mystery of the love that motivated Him to make that journey. In stanza four we are reminded how God brings us to salvation in language that reminds us of Peter's experience in Acts 12:6-11, where God sent an angel to open the prison doors and loose Peter's chains. The final stanza is a jubilant celebration of our new state in Christ and the privilege of communion with God that we enjoy. 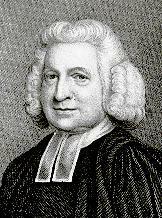 “And Can It Be” was written by Charles Wesley in 1738, in response to his conversion to belief in Christ. It was published in John Wesley's Psalms and Hymns in that same year with six stanzas. In a later republication by the Wesleys in 1780, the original fifth stanza was omitted (beginning “Still the small inward voice I hear”), and this revision has been honored ever since. This hymn usually appears with all five stanzas, though sometimes the second (beginning “'Tis mystery all!”) is omitted. The refrain is a repetition of the last two lines of the first stanza. Sometimes there is an expanded refrain, in which these two lines are sung twice after every stanza, replacing the last two lines of the second through fifth stanzas, but this omits some important lines of the hymn. 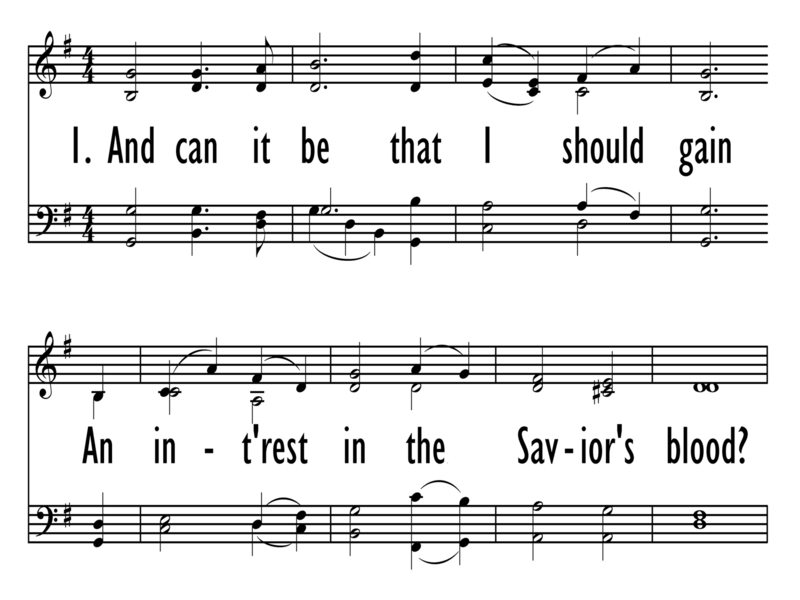 In the nineteenth century, FILLMORE was the most common tune this hymn was sung to. However, in the twentieth century this text was paired with SAGINA, and with few exceptions, this is the only tune used today. SAGINA is by Thomas Campbell, about who little is known other than that he published The Bouquet in 1825, a collection of twenty-three tunes with botanical names. “Sagina” is the name of a genus of flowering plants. The tune is fairly well-known, but it can present difficulties for congregational singing because of its wide range and frequent melismas. It is a good idea to sing in parts, especially on the refrain. One unusual way to use this hymn would be to have the choir sing Lloyd Larson's setting of Wesley's text to the music of classical composer Gabriel Fauré's “Pavane,” titled “How Can It Be?”. The soft, haunting mood of this arrangement is best suited for Lent or Holy Week, and allows the listener to contemplate the sober reality of Christ's sacrifice. The collection “Amazing Love” by Mary MacDonald includes an arrangement for organ and piano duet that is more suited to the jubilant mood this hymn is normally sung with. Another instrumental setting of “And Can It Be” is the trumpet and trombone duet with piano accompaniment by Dana F. Everson. 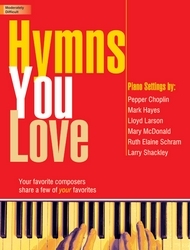 “The Festival Hymn Collection, volume 2” contains a setting of this hymn, with organ introduction, two settings of the verse, and an optional descant.